On Friday night April 26th the Hudson-Berkshire Division met at Frank Adamec's house. 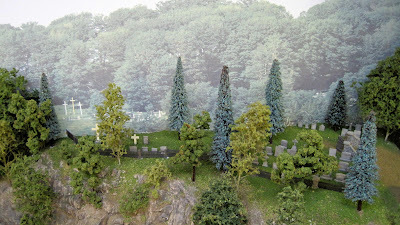 First time for Frank having anyone see the layout besides us. 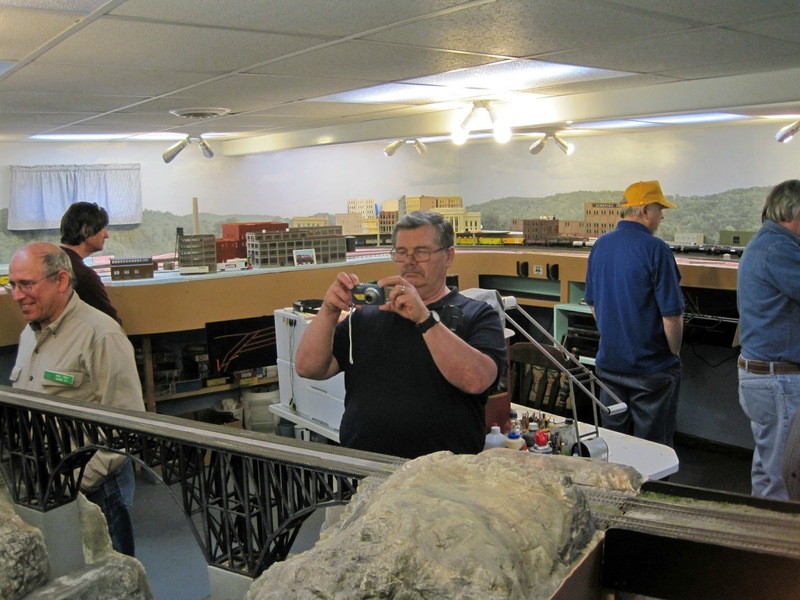 Over 30 people attended the layout and the trains ran smoothly! Overall shot of the main room. The duck-under was bolted down for the open house, good thing a few people bumped their heads! A view of Frank's single track version of the B&M's Hudson River Bridge in Mechanicville. 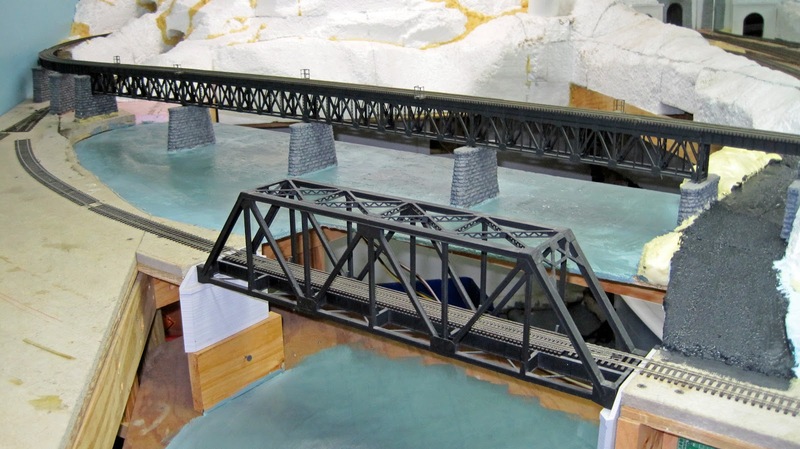 Finally a nice shot of Frank's scratch-build gorge bridge. 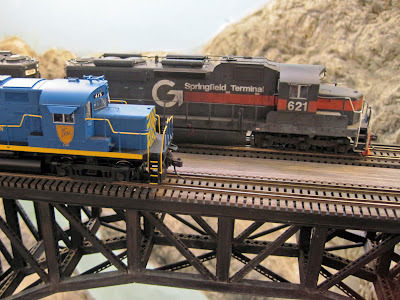 On2 1/2 pics of my WW&F Themed layout - enjoy - The turntable was a Walthers 90 ' HO turntable until I got ahold of it. The light house is the Squirrel Point Light on the Kennebec River but was transplanted to the Sheepscot river on my layout. The prototype is only 25' tall and Al Wood had some pictures and measured drawings that I used to build my version. 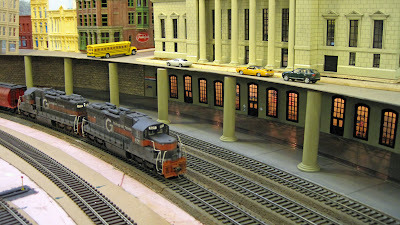 Overnight the Pennsy Heritage Unit led Pan Am train 23K out of New England! This event made for a great opportunity to visit another of my favorite locations, XO Tower in Mechanicville, NY. It has been quite a while since I was last down here. What better place to shoot a Heritage Engine? 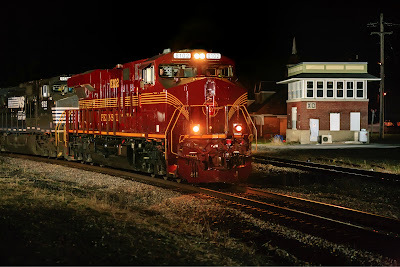 Tonight was my good fortune to shoot the Pennsy Unit a second time, having shot it on home rails passing Hunt Tower in Huntingdon, PA last spring. At a considerably higher rate of speed! LOL! Tonight, having learned of the NS 8102 leading on 23K via a text from Kevin Burkholder, I drove pretty much straight down here after stopping for a breakfast sub at the Hinesburg Subway and filling up with gas for the Civic. Arriving around 23:45, I spent over an hour setting up the lights and tweaking them due to an obstinate flash unit. Then waited nearly three hours for the appearance of 23K. The wait was worth it. Something different tonight was another night photographer, William Gill, who was set up several miles away to my east along “Fishermans Lane” in Schaghticoke, NY. William had been on location since around 21:30! We texted each other from time to time, William had more to contribute than I, as two westbounds passed by while he was there, which he in turned warned me of. 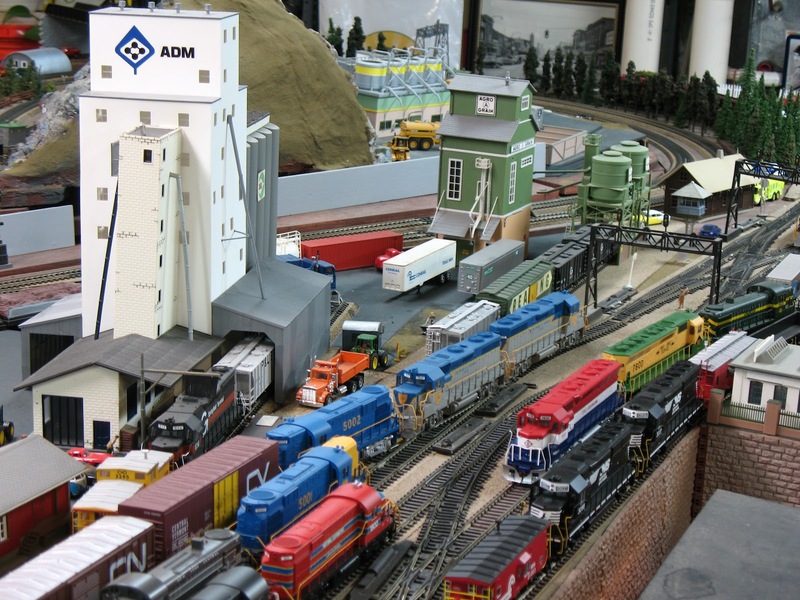 Unfortunately for William, neither train was the desired 23K, and having learned of D&H Dispatcher Gordy Smith giving an e.t.a. time of four a.m. for 23K, he relunctantly packed up and headed for home around 02:30, having agreed to help with masonry work the next day. I figured about thirty minutes after William left his spot, 23K appeared! Down in Mechanicville, having learned from William of Gordys e.t.a. for the train, I was warming up in the car with the drivers side window cracked open..............just in case, in an effort to avoid the embarrassing “Surprise! Here we are!” shock of seeing nearby grade crossing signals light up. LOL! Outside temps around thirty with a stiff wind, it seemed like the place to be. Then I heard it, faintly, off in the distance, the melodious air horn. I remembered it instantly from my encounter with the Pennsy engine last spring, waiting for it to appear at Hunt Tower. Returning from an appearance at the Pennsylvania State Railroad Museum, it had activated the talking equipment detector off to my east, and the engineer identified NS 8102 as the leader courtesy of my car scanner. 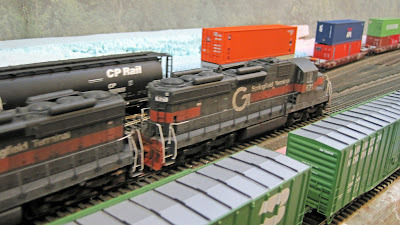 Running with two members of the NS executive F unit fleet, it was quiet enough so I could hear the F’s 567 prime movers! Then I heard that distinctive air horn, beautiful! In a matter of a couple minutes, NS 8102 was there in front of me...........and gone, the photo captured. Tonight, I have the luxury of a considerably “greater” amount of time between hearing NS 8102s air horn, and seeing it appear before my camera! LOL! I fire off one last test shot, the results still look fine, then wait. Life is wonderful at moments such as this. 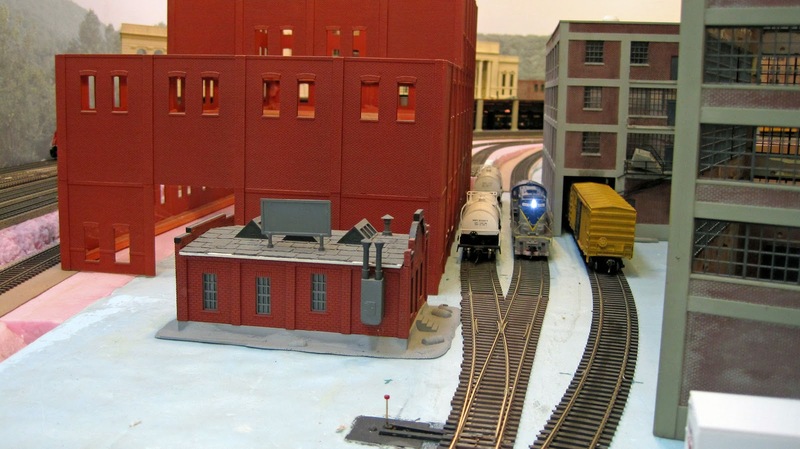 Eventually, headlights are sighted, grade crossing gates are activated, and it’s show time in Mechanicville! 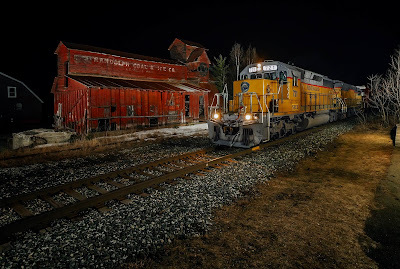 Slowly rounding the curve, (we are just east of the throat of Mechanicville Yard here) into the location comes one of a kind Pennsy Heritage Unit NS 8102. The “too bright” number boards glare, the paint gleams even at night! Reaching the spot I have manually pre-focused on, the lighting does its thing, camera and lens capturing the moment! Tuscan Red and pinstripes passing XO Tower! It was worth the wait. Another grand reunion with one of my favorite locations for night photos. 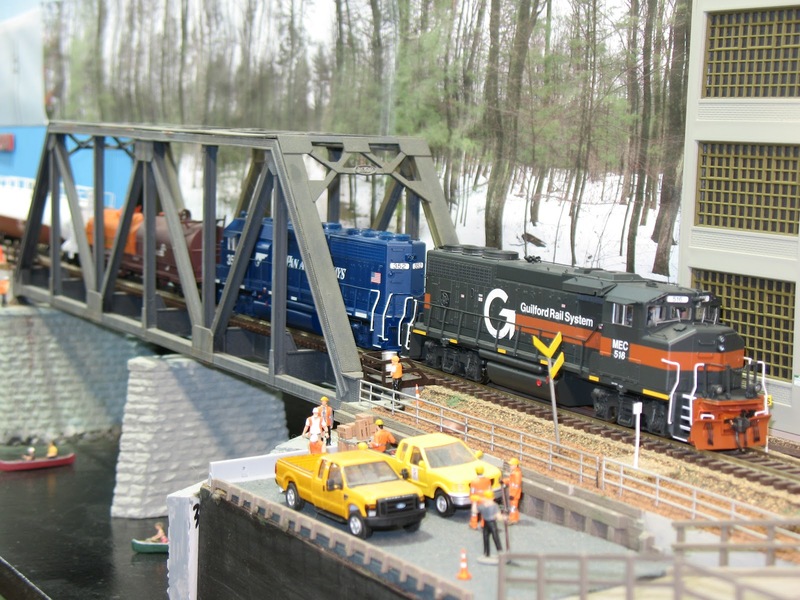 Shot in Mechanicville, NY on April 21, 2013 at 03:37 with the 5D and Zeiss ZF 100/2 lens. This is the first time the number boards were not completely blown out on these Heritage engines, it could be this superb lens. I removed two telephone poles behind the trailing unit in photoshop. Special thanks to Kevin Burkholder and William Gill! Please enjoy! 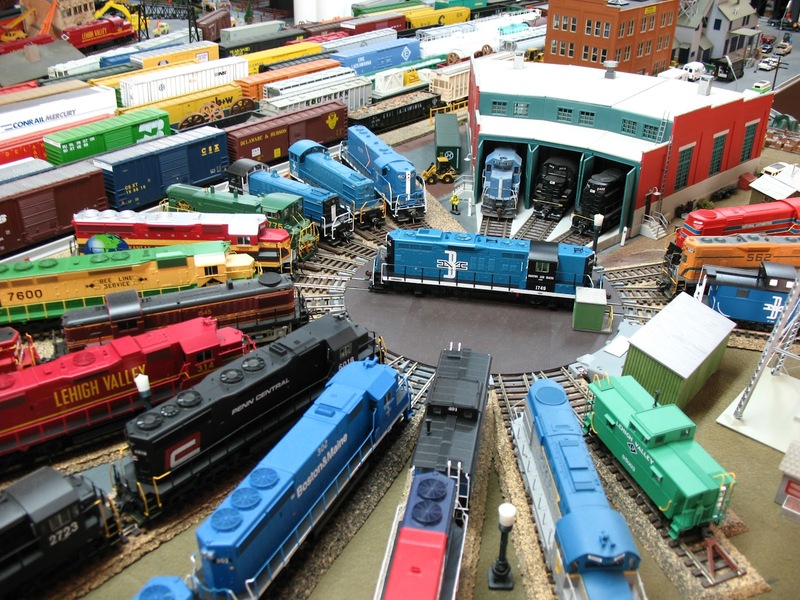 Train Nite, April 2nd At Frank's! A EDSA rolls past Frank Adamec's Saratoga station. 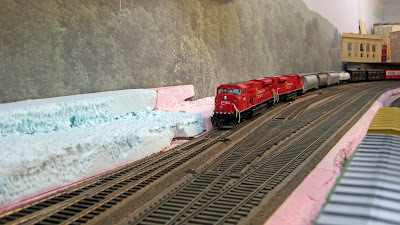 CP Train 251 leaving Saratoga heading north to Rouses Point. A lone D&H lighting stripe works it way through the paper after setting out empties for pick-up. EDSA passing through Saratoga yard. Frank has finally started scenery, noticing the cemetery in the backdrop he decide the hill above the tracks would be a good place for old railroaders to go! Amman's Fuel up on the hill EDSA rolls pass. 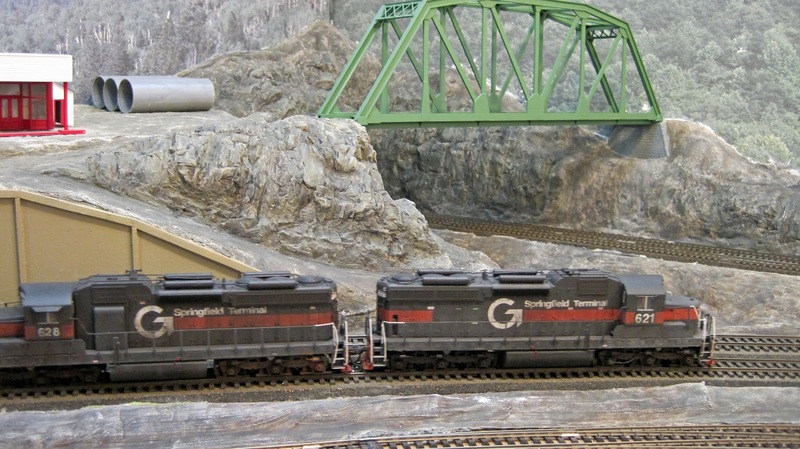 I painted the Hudson riverbed and Steve painted Rte 4&32. 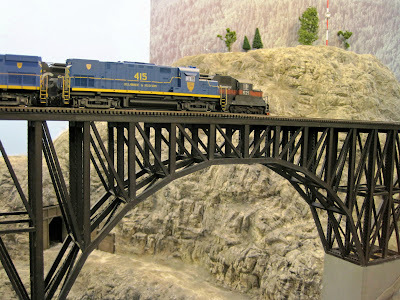 Frank scratch built a single track version of the B&M "Black Bridge" in Mechanicville. 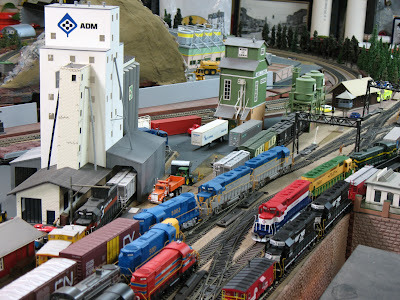 The Hydro dam will go in front of it and Akin Cement is off to the left. 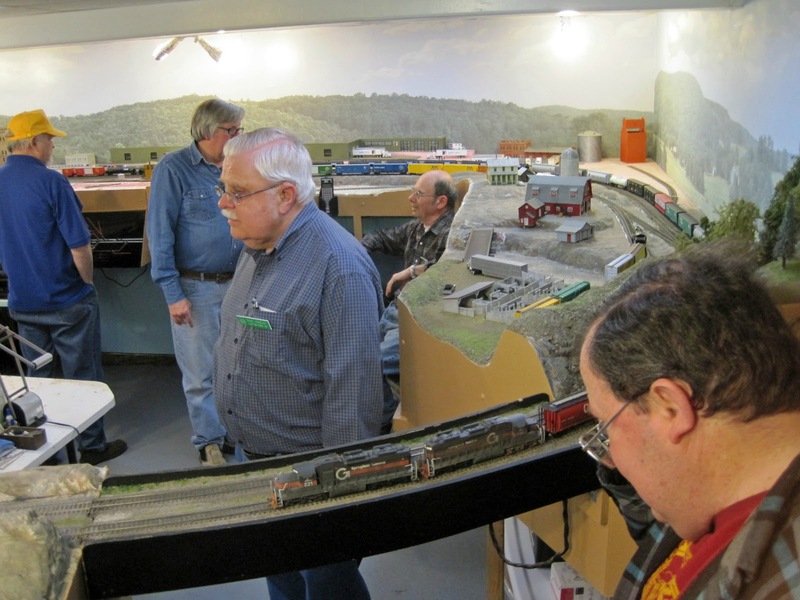 Overall we had a great turnout, trains ran pretty well, a few spots left to fix before the Hudson-Berkshire division meet at the end of April! It is a wonderful experience, visiting favorite night photo locations for the first time since my operation/hospital stay! I had not been motivated to visit the NECR since getting back home due to their new call times for 324/323, which were six hrs. later than their previous times. This put them in daylight for much of the run. This week, I learned the call times for 324/323 have been changed back to the old times! Talk about a gift! Tonight, upon confirming 324 had a good leader, SD 40-2 721, I drove down to Randolph and happily found the Randolph Coal & Ice shed, (a modelers delight!) had survived the winter in fine condition for a structure of its age. A survivor from the steam era on NECR predecessor Central Vermont Railway, the photogenic building witnessed New Englands largest steam locomotives, the CV 2-10-4s passing by. I’m on cloud nine being able to visit favorite night photo locations such as exists here, once again. Spring arriving in Vermont always seems to be viewed with a mix of skepticism and good humor, LOL! Tonight temps are a good indicator as to why. While I was here in Randolph, the temp was 23 and the wind chill................10. The soon to be retired for the season down parka is still useful in April! As is the rest of my “depths of winter” clothing. I do remember it is a lot more fun to be warmer than I would like rather than slightly colder! Standing atop the stepladder, waiting and then hearing 324 blowing for crossings north of town, maybe five to ten minutes out..............it is euphoric to be back here! 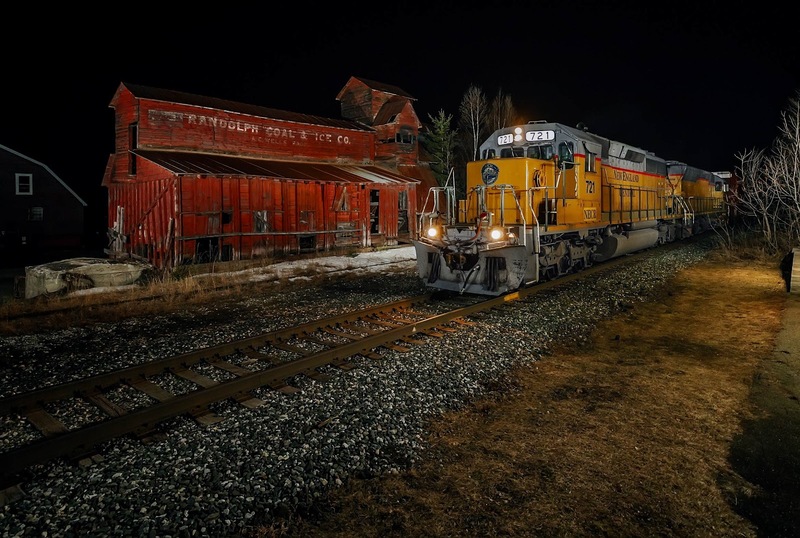 Shot in Randolph, Vermont on April 4, 2013 at 02:25 with the 5D and Nikkor 14-24/2.8 lens set at 21mm. Please enjoy! I had a few shots on my work PC. I hope you like them. The digital photography really shows the flaws, so I have fixed many of them since these were taken.